Every year, millions of Americans make a New Year's resolution to lose weight and keep it off. If you want to achieve that goal, common sense exercise should be a part of that equation, in my humble opinion. But to really stick with it, make it fun. Some people make a god out of exercise. They virtually worship their bodies. That’s obviously wrong. The Apostle Paul says that the body of a Christian is “the temple of the Holy Spirit.” The clear context of that discussion is in reference to avoiding sexual sin. Nonetheless, I think a case could be made that we should try to take reasonable care of our temples. Studies seem to consistently show that exercise is good for you, including walking. For the last 15 years, since I began to run many 5ks, 10ks, and the like, I have found I am generally less likely to get sick. I remember one of the best compliments I ever received related to my health was when my doctor once looked at my EKG and said, “Wow, like a 21-year old.” This was when I was 55, after several years of vigorous exercise a few times a week. My earlier experience with competitive racing used to conjure up painful memories of always being last at the annual races as a kid. My dad would drag me to these races, where I would always be humiliated. One year, I was elated. Another guy tripped, and so I came in second-to-last. Fast forward 40 years, and one day I was invited to run a race at our church-run school to help benefit Alzheimer’s research. I did it, and I actually enjoyed it. Since that day in January 2003, I’ve run multiple races, even one full marathon. I’ve learned not to compete against the other runners — although they make me strive to go faster. I compete against myself, trying to better my time. One of the runs is called a “fun run.” A friend objected, “If it’s a run, it’s not fun.” But I don’t agree. Besides, the discipline gained in one area of your life, such as exercise, tends to spill over in other areas of your life. Spiritually, it’s great to remember that life is a marathon, not a 50-yard dash. A runner friend encouraged me to start running — “Sure beats the doctor bills,” he would say. He used to chide me for getting a little too overweight. “Oh, Jer,” he would joke, pointing to my midsection, “I wonder if I could borrow your pillow for a while?” He also made timpani-like sounds when I would walk. He stopped those jokes when I ran off the pounds. Of course, no one should undertake running or other rigorous exercise without a doctor’s advice. Is running a marathon dangerous? Donald Ardell, PhD., who wrote the book High Level Wellness, writes: “Personally, I think the health risks for marathoners and iron-types are minuscule compared with the serious risks faced by three quarters of Americans who are overweight or obese and exercise averse. Consider the risk of sudden death during a marathon is one in 50,000. 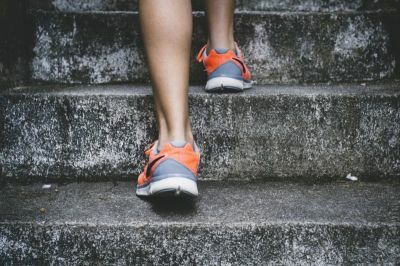 Getting out of bed is more dangerous than that for the overweight smoker who hates his/her job, spouse, and life in general.” Yes, but obviously, there are many healthy exercise options far less time-consuming and even risky than marathon-running. A recent study reported that lifting weights is even better for you than cardio exercise. I do both at the gym. Lately, I tend to exercise more in the gym than on the jogging trail. There are only so many bangs on the pavement the knees can take. I want to be able to exercise when I’m old. I know a man who started exercising regularly — just recently. He hates it. I predict that because he hates it, he’ll soon quit. The best exercise to pursue is the one you actually will follow through on — whether it’s weightlifting, walking, running, half-marathon running, swimming, whatever. Why not make 2019 as a time to get fit once and for all — and enjoy the process as well as the results? What's the Ideal Time for Exercising?